Gary Illyes at Pubcon announced today that Google is switching to a mobile first index. This means that Google will be indexing the mobile versions of pages and not the desktop as its primary index. This is a huge change. Google has always used the desktop version of a page for ranking, even when serving results to users on a mobile device. Do note that this mobile first index is not live now. This is the pre-announcement so SEOs and site owners can be prepared for the upcoming change. IHere are all the details about this new mobile first index change. Since mobile search share continues to grow – it has been well over 50% for years now – this move is not surprising. Many site owners make their mobile page a much lighter version of the page. But with Google doing a mobile first index, this means that site owners will need to think carefully about what they place on those pages. If the content your desktop version of the page has does not appear on the mobile page, a site owner could lose traffic to those pages for those keywords. Site owners that serve two different versions of a page, depending on whether a visitor is on mobile or desktop, will need to think about this change and how to react to it. For sites that use responsive design for example, and have the same content on both desktop and mobile should be fine with this change. Because there isn’t the loss of part of the page – such as the article – the indexing should be fine. Many site owners only check their mobile version of the page to ensure it is mobile friendly or not. However with this change, site owners should check their mobile pages to ensure their pages are serving the correct content. In Google Search Console, site owners can check their pages via Fetch and Render to see exactly what Google is seeing. You will need to select the mobile user agent though, as it defaults to the desktop version. Site owners often remove structured data from the mobile version of the page to make the page lighter. But in order to keep the structured data for your pages in the search results for mobile, site owners will need to ensure the structured data appears on their mobile pages. There will still be a desktop index, but Illyes stressed that this index will not be as fresh as the mobile index. 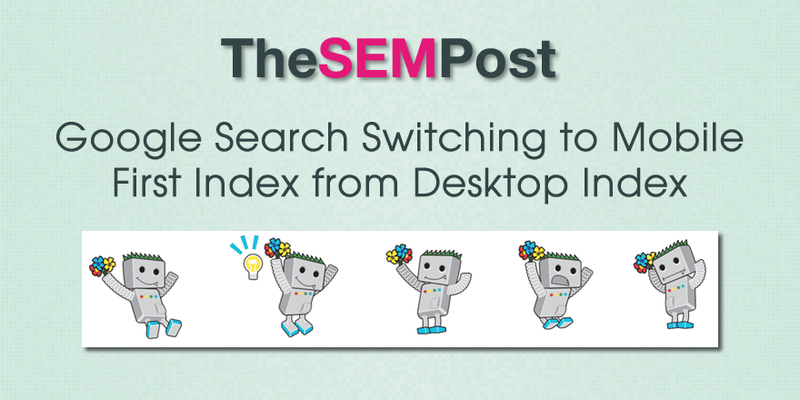 So Google is not eliminating the desktop index, but the mobile one will be the primary and freshest index. Illyes did mention that links are an issue because people tend to not link as much on the mobile web compared to desktop. When Will Google Change to Mobile First Index? Illyes did say that he will not give dates for this because dates can change. He did say that Google will be announcing it with a blog post, which will include details about when Google makes the change to mobile first indexing. It is also worth nothing that Google has given plenty of notice about the changes they have made with mobile indexing, such as when they made the plan to add a mobile friendly ranking boost. Well AMP are mobile friendly, but it is still canonicalized, so Google would index the mobile page. But you can use AMP only as a mobile strategy, so those pages would then be indexed. Should we now be thinking of the mobile version of the page as the canonical version and the desktop as the alternate and mark them up as such? Google will be making more announcements closer to when it will go live, and I imagine this will be one of the things included for it. So in terms of what index they’ll appear in, what will be the effect on sites that built responsive sites, but not mobile-first? Those pages would still be considered mobile, even as responsive. Thanks for the write-up Jennifer, interesting (but expected) move. What are your thoughts regarding optimizing titles and meta descriptions for mobile instead of desktop? I think we will see a lot more testing with this once Google changes it over. But optimizing mobile versions of the pages (if not responsive) will be important. How can i check that how many mobile pages are indexd in google? It would seem to me that “mobile first” web design is about to take a great leap forward after reading this post. This is going to be a big kick in the pants for many web designers who have not grasped the importance of designing for all devices. I am still surprised at the number of sites that still aren’t local friendly. I was in Australia earlier this year, and I don’t think I found a single restaurant website that was mobile friendly that I tried to visit. Another mass that google will create, then in 6 months of not being able to hadle it, will revert back, like with the other stupid changes. This does not mean not to be mobile ready. Unless people stop searching as much on their mobile devices, I can’t see them changing this.